American watch manufacturers Hamilton have been making ground breaking watches since 1892. Leaders in style and design, this striking stainless steel watch features a classic brown leather strap set with a detailed black chronograph dial. Powered by automatic movement and water resistant up to 100 metres, this Hamilton combines premium function and design. Hamilton are manufacturers of fine sports watches. Multifunctional and incredibly stylish this watch features multi dial. Hamilton Khaki X-Wind men's watch is rated 5.0 out of 5 by 1. Rated 5 out of 5 by Anonymous from first class dial and case this is a fine watch from hamilton. 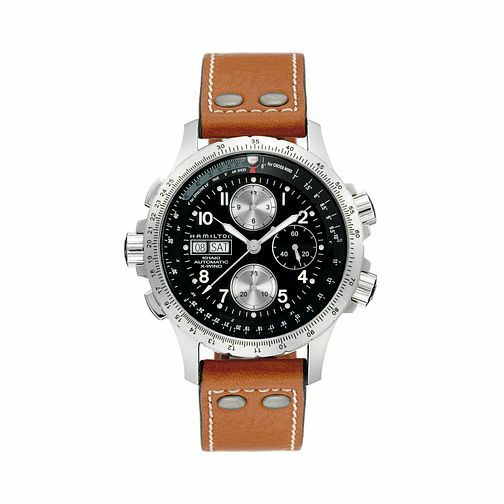 combines all the functions of a chrono with the addition of being ideal for a pilot. the dial is not to cluttered and to sum this watch up i would say fantastic.